The cost of a college education in America is greatly increasing more than ever today. Once a leader in higher education, America is rapidly slipping behind other first-world counties across the globe. According to a research study done by the White House on higher education in the United States, “In 1990, the U.S. ranked first in the world in four-year degrees among 25-34 year-olds; today, the U.S. ranks 12th. Access to higher education and affordability are two of the main reasons for that fall.” However, with the right tools, it is possible to get the college education you want on a budget and with the aid you need. 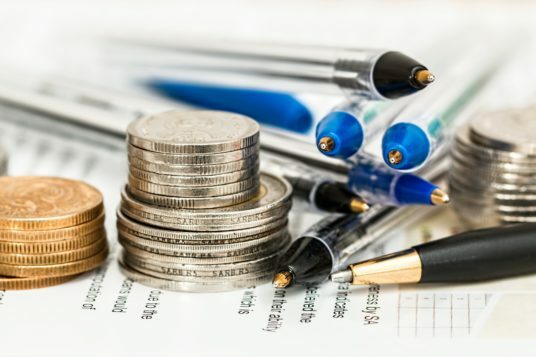 Financial aid, and knowing how to find the right kinds of financial aid, is key in having a stress free college career – whether you are going two years to a community college, into a four year undergraduate degree program, or into post graduate work and beyond. You want to get the most value out of your years at university and having your financials taken care of relieves one of the biggest stresses for most college students today. Help with financial aid will give you the opportunity to focus on what really matters – getting the most value out of your college career. The first step in understanding what kind of financial aid you will need is to figure out exactly what defines the cost of college. 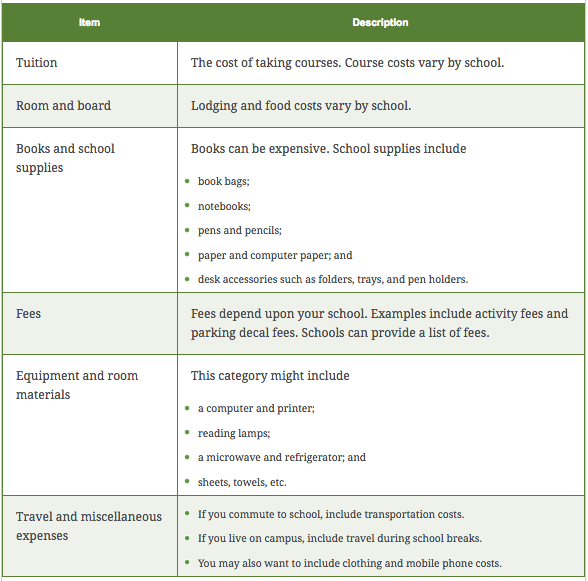 College costs include tuition, room and board, books and school supplies, fees, equipment and room materials, travel and miscellaneous. You can obtain the costs of your tuition and room and board, your fees and then an estimate of other living expenses from your college’s financial aid office. Once you have this information, you are ready to find the right kind of aid to help you pay for college. According to The College Board there are three main or traditional types of financial aid available for college students. Loans can include personal bank loans, federal loans, and any other type of borrowed money that must be eventually paid back. The most common loans taken out by college students are federal loans and of the federal loans, the federal Stafford Loan is most popular. Depending on whether you get a subsidized or unsubsidized loan, your loan may not collect interest and doesn’t have to be paid back until you complete your college years and step away with a degree. The Federal Student Aid office is a great resource for learning more about all the loans available to you for college. The Stafford Loan is beneficial for other reasons too. When it comes time to pay back you can choose to have an income-based repayment plan or pay ahead on your loan. Also, the Stafford Loan typically has low interest rates and you can defer your payments if you need to. Personal bank loans or private loans are real viable options for obtaining money for college, but remember, a loan has to be paid back. Have a firm grasp on your interest rates and what that means you will be paying long term. Most important, however, is no matter what loan you take out, do not take more than you need! Student loans are large and last a long time – you don’t want to find yourself paying back and owing more than you will ever be able to manage. Grants and/or scholarships are really wonderful additions to, or replacements for, taking out student loans. Unlike a loan, money from a grant or scholarship does not have to be paid back. This means once your money is awarded to you, it is essentially gifted to you – you are literally being handed money. On the flip side, sometimes grants and scholarships are a harder to obtain than student loans because you have to do your research, know what you are asking for and why, and then be selected and awarded the money from a large and competitive pool of applicants. Who can apply? As long as you fit the applicant criteria, you can apply for any grant or scholarship you find. Many grants and scholarships are targeted and specific. For example, there may be a grant for a particular area of study like a first year biology grant, or a scholarship for a particular demographic, say for example, African Americans obtaining a Doctor of Nursing (DNP) degree. Since grants and scholarships are so specific, you will have to do your research. Do your research. Go to your financial aid office and ask for help. Visit the Federal Student Aid website for information on obtaining a scholarship. The College Scholarships website is another great resource for finding both scholarships and grants. Visit your university’s website and your department to see what’s available there. Check with local businesses and non-profits to see if they offer any scholarships. Ask your advisor and talk to your professors. The more research you do, the more likely you are to find a scholarship or grant that fits your need. Find scholarships and grants that are lesser known, giving you a better chance to receive them. If less people apply, you are more likely to be selected. Although they likely won’t pay your way through college, another viable source of income for many college students is found through employment programs such as work-study. So what is work-study exactly? Well, just as the title suggests, work study positions are typically jobs on campus that offer flexible hours and schedules so that students can still put the majority of focus on their study while earning a little extra money to help pay for college. Some examples of work-study positions may be, working in the library, tutoring, employment in the cafeteria, serving as an assistant to a professor or department of study. The list goes on and on. To find out what work study options may be available to you check with your colleges financial aid office. Financial aid is a beautiful thing, although the process of weeding through your options and choosing what’s best for you can seem tough. But remember, financial aid in many ways makes an unaffordable college experience, affordable. When you get financial aid, you can then judge which college is affordable on the net price you will be paying, not the sticker price. 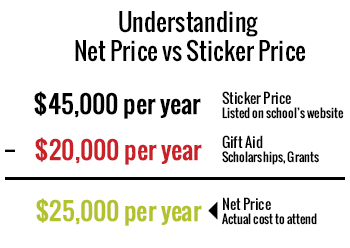 The sticker price for a college is the total price of tuition for the number of years you will be in school. The net price is your actual cost after you take away what you have received in financial aid. Remember though, loans will have to be paid back and collect interest. Take these expenses into consideration in your net price too. If college still seems too expensive, consider a few other options. Going to community college for your first two years of school will certainly save you money. Here are the Top 10 Best Value Community Colleges , a list to direct you to finding the best education at the lowest price for a two-year degree. Another simple way to enjoy college on a budget is to choose a college in a town that has a low cost of living. Some of the best schools in our nation are located in towns or cities that provide affordable living options for people from all walks of life. If the college town has a low cost of living, day-to-day expenses, like your groceries and bills, will be more affordable than if you were living in a place with a high cost of living such as a big city or beach town. At the end of the day, financial aid is a key step in understanding and managing your college experiences. Use the resources available to you to find the best way to pay for college so that you can get the most out of your college experience without a lot of debt.